A two-hour TV program about panspermia and related topics is available on the Internet. Related topics include interplanetary dust, Mars, moon rocks, comets, meteorites, craters on Earth, Europa, and many more, all discussed by recognized experts. Exploring Space: The Quest for Life, co-produced by NHK Japan and KCTS Television, 2005. Introduction: More Than Panspermia is a related local webpage. Thanks, Google Alerts. "Human intervention has subjected the yeast Saccharomyces cerevisiae to multiple rounds of independent domestication and thousands of generations of artificial selection.... [W]e have produced whole-genome assemblies of six commercial strains of S. cerevisiae (four wine and two brewing strains).... By comparing these sequences to six existing high-coverage S. cerevisiae genome assemblies, clear signatures were found that defined each industrial class of yeast. This genetic variation was comprised of both single nucleotide polymorphisms and large-scale insertions and deletions, with the latter often being associated with ORF heterogeneity between strains. This included the discovery of more than twenty probable genes that had not been identified previously in the S. cerevisiae genome. Comparison of this large number of S. cerevisiae strains also enabled the characterization of a cluster of five ORFs that have integrated into the genomes of the wine and bioethanol strains on multiple occasions and at diverse genomic locations via what appears to involve the resolution of a circular DNA intermediate [illustrated]. This work suggests that, despite the scrutiny that has been directed at the yeast genome, there remains a significant reservoir of ORFs and novel modes of genetic transmission that may have significant phenotypic impact in this important model and industrial species." Borneman AR, Desany BA, Riches D, Affourtit JP, Forgan AH, et al., "Whole-Genome Comparison Reveals Novel Genetic Elements That Characterize the Genome of Industrial Strains of Saccharomyces cerevisiae" [html], PLoS Genet 7(2): e1001287. doi:10.1371/journal.pgen.1001287, online 3 Feb 2011. We'll create panspermia if it didn't already exist — J.Craig Venter at Arizona State University's panel discussion of the definition and origin of life, February 12. Scientists Debate Life's Origins, ASU, 12 Feb 2011. Scientists debate life's origins, ASU, 23 Feb 2011. A Romp Into Theories of the Cradle of Life by Dennis Overbye, The New York Times, (+stltoday.com), 21 Feb 2011. What Is Life? is our webpage about defining life. The RNA World: our webpage about origin-of-life theories. 7 Aug 2015: Link to a video from the conference. A virus integrated into the genomes of humans and great ape males helps to eliminate defective germline cells. This function is critical among hominids, because the males may reproduce for decades. The insertion, from an endogenous retrovirus (ERV9), apparently occurred just after long-lived apes diverged from our closest nonhominid relative, Hylobates lar (gibbons). The affected gene, designated GTAp63, is among the homologs of p53, and is most closely related to TAp63. The big difference is that its upstream end begins with a long terminal repeat (LTR) sequence contributed by the virus. This sequence promotes the transcription of three upstream exons (red rectangles in figure below) that would otherwise be omitted. When DNA damage is detected in a germline cell, this gene produces an enzynme that supresses proliferation and induces apoptosis (cell death). The gene also appears to supress testicular cancer in humans. The research team, from Germany and the USA, comment, "In Hominidae, this guardian function was greatly enhanced by integration of an endogenous retrovirus upstream of the TP63 locus that occurred 15 million years ago. By providing increased germ-line stability, this event may have contributed to the evolution of hominids and enabled their long reproductive periods." 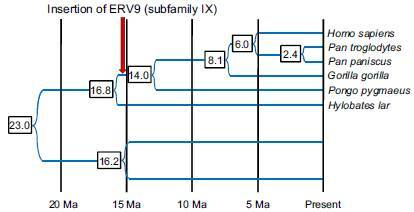 Interestingly, another insertion of an ERV9 apparently restored a different gene in the primate lineage, before gibbons and hominids diverged. In fact, known instances of beneficial genetic programs or subroutines installed by viruses, in all of life's domains, are accumulating steadily, as expected in cosmic ancestry. Ulrike Beyer et al., "Endogenous retrovirus drives hitherto unknown proapoptotic p63 isoforms in the male germ line of humans and great apes" [abstract], doi:10.1073/pnas.1016201108, p3624-3629 v108, Proc. Natl. Acad. Sci. USA, 1 Mar (online 7 Feb) 2011. Beverly A. Purnell, "No Damaged Daddies" [html] in "Editors' Choice", p825 v331, Science, 18 Feb 2011. ...The gene has been 'dead' for at least 25 million years...., another insertion by ERV9, What'sNEW, 10 Mar 2009. Human Genome Search... is a related local webpage. A 23-gene cluster was horizontally transferred among fungi, according to two biologists at Vanderbilt University in Nashville TN. The sequence of genes was shuffled (see figure), but the content of individual genes was well-conserved. Thus, the transferred cluster apparently retained its capability to produce a secondary metabolite in the recipient species, Podospora anserina. "Our finding that one of the largest metabolic gene clusters moved by HGT between fungi suggests that nonvertical transmission of the numerous metabolic gene clusters present in fungal genomes might have significantly contributed to the remarkable metabolic diversity of fungi.... [T]he increasing number of reported HGT events between fungi adds support to the notion that HGT-acquired DNA is a significant contributor to fungal genome remodeling." HGT among eukaryotes is becoming increasingly apparent. Here we see that even a 23-gene cluster may be functionally transferred. We hope darwinists will notice. Jason C. Slot and Antonis Rokas, "Horizontal Transfer of a Large and Highly Toxic Secondary Metabolic Gene Cluster between Fungi" [summary & video link], doi:10.1016/j.cub.2010.12.020, p134-139 v21, Current Biology, 25 Jan 2011. Discovery of jumping gene cluster tangles tree of life by David Salisbury, Vanderbilt University, 4 Feb 2011. First evidence of gene transfer from human host to bacterial pathogen is reported by microbiologists at Northwestern University in Chicago. The transfer appears to have happened recently. We are not surprised, because we think ongoing gene transfer is essential for evolution. 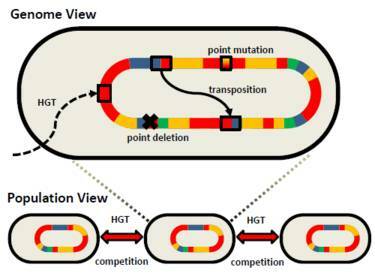 Anderson MT, Seifert HS, "Opportunity and means: horizontal gene transfer from the human host to a bacterial pathogen" [abstract], doi:10.1128/mBio.00005-11, e00005-11, 2(1), MBio, 15 Feb 2011. Gonorrhea acquires a piece of human DNA by Marla Paul, Northwestern University, (also EurekAlert.org), 14 Feb 2011. Microbes have stolen some of our genes! — an earlier example? — What'sNEW, 27 May 2004. The recently sequenced water flea genome brings several questions to our mind. 1) Now that hundreds of different species have been genome-sequenced, the number of unique, newly observed genes should be diminishing. Why, instead, do they keep piling up? 2) Water fleas are known to remain viable for decades (and their eggs, centuries), buried in lake- and pond-bottoms. Could they somehow remain viable for millions of years, frozen in comets? 3) This tiny crustacean, 1-3.5 mm long, has ~25% more genes than humans. Why wouldn't humans have the most genes of all? 4) Water fleas filter water and consume algae near the bottom of the food chain. Could they serve as agents for horizontal gene transfer? John K. Colbourne et al., "The Ecoresponsive Genome of Daphnia pulex" [abstract], doi:10.1126/science.1197761, p555-561 v331, Science, 4 Feb 2011. Dieter Ebert, "A Genome for the Environment" [first paragraph], doi:10.1126/science.1202092, p539-540 v331, Science, 4 Feb 2011. Massive Daphnia Genome Leads to Understanding Gene-Environment Interactions, University of New Hampshire, 3 Feb 2011. ...Tiny Organism, Big Sequence by Jennifer Carpenter, ScienceNow, 3 Feb 2011. 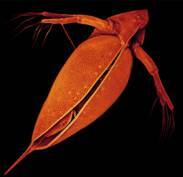 Tiny Water Flea Clocks In Record Number Of Genes by Joe Palca, NPR, 6 Feb 2011. Animal with the most genes? A tiny crustacean, Indiana University, 3 Feb 2011. Water flea genome offers revolution in toxicity testing by Virginia Gewin, NatureNews, 3 Feb 2011.
worthy of Fred Hoyle is the subject of a Reply from Edward W. Kyle, 8 Feb 2011. This article has become a new webpage: Genes Older Than Earth?, posted 8 Feb 2011. Chandra Wickramasinghe has a new article about panspermia, available online. N. Chandra Wickramasinghe, "Viva Panspermia!" [link | 5-page PFD], arXiv:1101.4295v1 [astro-ph.CO], 21 Jan 2011. Introduction: More Than Panspermia and Chandra Wickramasinghe are related local webpages. Genes for using oxygen appeared... around 2.8 billion years ago, long before oxygen began accumulating in the atmosphere around 2.5 billion years ago. This comment follows a deep genomic analysis of hypoxia-inducible transcription factor (HIF) by a German/British multidisciplinary group. HIF is essential for several oxygen-dependent processes among all multicelled animals. Its apparent existence before oxygen accumulated on Earth is a major puzzle for darwinian theory, because there would have been no environmental pressure — no reason at all — to invent it by natural selection. Furthermore, the team found no likely HIF precursors in the genomes of single-celled animals older than Trichoplax adhaerens. Overall, these results suggest that there might be a core set of genes that.... helped to enable animal life to respond to metabolic challenges, including the increase in atmospheric oxygen levels on the Earth over the course of animal evolution. — Loenarz et al. Genes that are older than darwinism would indicate and genes that appear suddenly, without apparent precursors, are basic predictions of cosmic ancestry. Christoph Loenarz et al., "The hypoxia-inducible transcription factor pathway regulates oxygen sensing in the simplest animal, Trichoplax adhaerens" [abstract & login link], doi:10.1038/embor.2010.170, p63-70 v12, EMBO reports, 4 Jan 2011. Kalle T Rytkönen & Jay F Storz, "Evolutionary origins of oxygen sensing in animals" [abstract & login link], doi:10.1038/embor.2010.192, p3-4 v12, EMBO reports, 4 Jan 2011. 550 million years ago rise in oxygen drove evolution of animal life, EurekAlert, 17 Dec 2010. Gene genesis by Tina Hesman Saey, ScienceNews, 21 Dec 2010. Gaia is a related local webpage. Metazoan Genes Older Than Metazoa? is the main related local webpage. Genes Older Than Earth? has more about this phenomenon in a textbox. Thanks, Stan Franklin, and others whom we may have forgotten! NASA has found left-handed amino acids in many more carbon-rich meteorites. This proves that its initial detection, in Murchison for example, "wasn't a fluke; that there really was something going on in the asteroids where these meteorites came from that favors the creation of left-handed amino acids," says Daniel Glavin of NASA Goddard, lead author of a paper about this research published online in Meteoritics and Planetary Science, 17 January. Now another correlation is noted. "...Liquid water seems to be the key.... We can tell how much these asteroids were altered by liquid water by analyzing the minerals their meteorites contain. The more these asteroids were altered, the greater the excess L-isovaline we found. This indicates some process involving liquid water favors the creation of left-handed amino acids." On Earth, isovaline is a rare amino acid that is not among the 20 essential for life. But we wonder, could it be used by life elsewhere? Or, could it be a byproduct of life's amino acids, degraded after long exposure in space? Anyway, life is the only process we know of that efficiently makes exclusively left-handed amino acids. And life depends on water. Obviously, past life in water on the parent bodies of these meteorites is one good way to explain the new data. But NASA's press release gives no indication that this possibility ever entered their minds. Really? More Asteroids Could Have Made Life's Ingredients, NASA, Goddard Release No. 10-006, 18 Jan 2011. Did meteorites preordain left-loving life?, Nature.com, 19 Jan 2011. 'Life chemicals' may have formed around far-flung star by Jason Palmer, BBCNews, 26 Jan 2011. Amino Acid Asymmetry in the Murchison Meteorite! is the main related local webpage, posted 14 Feb 1997. Predominantly left-handed amino acids... discusses earlier research by members of the same NASA team, What'sNEW, 17 Mar 2009. Thanks for additional links, Stan Franklin and George Stratton. Many features appear to have originated more than once in the history of life on Earth. Examples include the physical similarity of sharks and dolphins, the similar cochlea of birds and mammals, and the resemblance between Tasmanian wolves (marsupials) and ordinary dogs (mammals). Convergence is the name applied to this phenomenon. The independent evolution of electrical communication signaling in African mormyroid fishes and South American gymnotiform fishes is another example of convergence. A recent analysis by evolutionary biologists concludes that the African and South American species arose separately, from nonelectrogenic ancestors, more than 100 million years after their lineages diverged. Darwinian theory might as well call it coincidence, because the evolution of nearly identical features, in unrelated species, entirely by mutation-and-selection, is unlikely. However, in cosmic ancestry, life's genetic programming is as old as life. After arrival, the programs must often remain silent for long evolutionary times, until the circumstances for their successful deployment arise. If so, we are not surprised if identical features that depend on the same genetic programming eventually crop up in long-diverged branches of the tree of life. In this instance, a gene for another function (in muscles) was duplicated in an apparent whole-genome duplication, likely between 226 and 316 million years ago. One paralog, Scn4ab (not shown), retained its original function and underwent few nonsynonymous mutations. The other, Scn4aa, long after duplication, underwent strong positive selection (indicated by red branches in figure) that yielded similar optimizing mutations for expressing the new function, in both lineages. The analysis is well worth reading. Darwinism may reply that there are many examples of genes that program more than one function. "Gene sharing" it is sometimes called. But in darwinian theory, how did an unexpressed gene remain uncorrupted for so long, and acquire new programming? And, are the parallel mutations just more coincidences? In cosmic ancestry, evolutionary convergence is best explained by pre-existing genetic programs held in common. These programs may sometimes reside within genes that have additional functions. If the genes are duplicated, the programs may be physically segregated, conserved for long times, and optimized within narrow ranges by software management systems within genomes. We think the parallel evolution of electrical communication in African and South American fishes supports this explanation. Matthew E. Arnegard et al., "Old gene duplication facilitates origin and diversification of an innovative communication system—twice" [abstract], doi:10.1073/pnas.1011803107, p22172-22177 v107, Proc. Natl. Acad. Sci. USA, 21 Dec 2010. Edmund D. Brodie III, "How an ancient genome duplication electrified modern fish" [extract], doi:10.1073/pnas.1016298108, p21953-21954 v107, Proc. Natl. Acad. Sci. USA, 21 Dec 2010. Convergent Evolution is the related section of our "Neo-Darwinism" webpage. Metazoan Genes Older Than Metazoa? is a local webpage with links to many examples of genes that exist long before they are expressed. Life's Solution is Simon Conway Morris's book about convergence, reviewed in What'sNEW, 16 Mar 2005. Geerat J. Vermeij lists 55 evolutionary innovations that arose more than once in an article reviewed in What'sNEW, 28 Jan 2006. 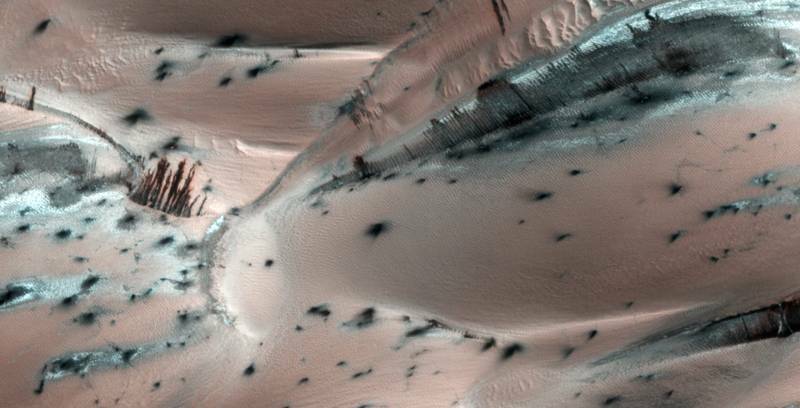 NASA sees no life on Mars, but the photos are nonetheless striking. Below is a detail from a Mars Reconnaissance photo taken in April 2008, near Mars' North Pole. NASA says that the apparent trees are actually cascades of dark sand appearing as the frost ablates away. Open the link for the full picture, which spans an area about 1 kilometer wide. Dark Sand Cascades on Mars, Astronomy Picture of the Day, 19 Jan 2010. Life on Mars! is a related local webpage. Thanks, The Wall Street Journal (page C12), 15-16 Jan 2011. Here is yet another example of horizontal gene transfer (HGT) from prokaryotes to eukaryotes. And the multiple instances of this example suggest that HGT from prokaryotes is systematic, not anomalous. We speculate that HGT represents a major source for evolutionary innovation in nematodes and might have helped nematodes to invade the diversity of ecosystems, in which they can be found today, such as parasites of plants, animals, including humans. In our reading, species acquire pre-existing genetic programs by HGT. On the other hand, if darwinian mutation-and-selection can compose new genetic programs from scratch, where is the hard evidence? Werner E Mayer et al., "Horizontal gene transfer of microbial cellulases into nematode genomes is associated with functional assimilation and gene turnover" [abstract], doi:10.1186/1471-2148-11-13, v11 n13, BMC Evolutionary Biology, online 13 Jan 2011. Anomalies in mainstream evolutionary theory have prompted a major amendment to darwinism. The anomalies include sudden increases in the complexity of animals during evolution, developmental programs shared by widely separated phyla, and the presence of genetic programs for complex features in simpler animals without those features. A 2007 paper outlining the amendment, titled "Universal Genome," from a cancer specialist at Boston University Medical School, has just come to our attention. We welcome this physician's straightforward acknowledgement that the anomalies are important and not rare, and that darwinism can not account for them. The appearance in evolution of the entire Metazoan fauna seems to have been very sudden. It appears that emergence of multicellular animals coincided with a dramatic increase in genome complexity in terms of both gene number and appearance of entirely novel gene families. Another surprise came from a complexity of compo­nents of the immune system in sea urchin.... Genes that are seemingly useless in sea urchin but are very useful in higher taxons exemplify excessive genetic information in lower taxons. ...How does it happen that convergently evolved systems have [the] same developmental switches? These findings are very difficult to explain within the context of Darwinian ideas. ...What we perceive as a sequential evolution is actually a reflection of expression of one or another combination of programs from the Universal Genome. ...Genetic evolution in combination with natural selection could define microevolution, however, within this model it is not responsible for the emergence of the major developmental programs. ...Explanation within the proposed model is quite obvious. The program of eye development has been present in the Universal Genome, and is latent in the majority of Cnidaria, and actually other, even more developed animal groups. This program however was turned on in Cubozoa, and led to the eye development in this group.... The program is poorly tuned resulting in an under-focused eye, suggesting that the Universal Genome contains relatively rough programs, and tuning the programs could occur through Darwinian mutation-selection mechanisms. Michael Sherman, "Universal Genome in the Origin of Metazoa" [abstract | PDF], p1873-1877 v6 n15, Cell Cycle, 1 August 2007. Metazoan Genes Older Than Metazoa? is a related local webpage. Neo-Darwinism: The Current Paradigm is a related local webpage. Panspermia Asks New Questions: "...What we have called "evolutionary progress" would actually be the local development of pre-existing, highly evolved life." Is Sustained Macroevolutionary Progress Possible? "...Perhaps what we call macroevolutionary progress is actually the incremental development of pre-existing, highly evolved cosmic life." The eyeless, earless [sea urchin] has genes that, in us, are involved in detecting sight and sound is one of our What'sNEW articles about the sea urchin genes (discussed by Sherman), 13 Nov 2006. The key to early eye evolution? is our What'sNEW article about the jellyfish eyes (discussed by Sherman), 21 May 2005. "Horizontal gene transfer, or HGT, is a ubiquitous feature of genome evolution...." So comment a pair researchers from the University of Illinois at Urbana-Champaign who used statistical methods from physics to quantify the role of HGT among ocean microbes. The two are well acquainted with HGT, and we are as interested in their general comments about it as in the statistical study proper. "...Genes can be transferred between living cells not related by heredity, and subsequently expressed. Comparative genomics indicate the widespread and frequent presence of this so-called 'horizontal gene transfer' (HGT) between organisms, not only those that are closely-related but also those that are distant taxa. Metagenomic surveys also quantify the unsuspected extent of the abundance of mobile genetic elements (MGEs) such as plasmids, viruses, and transposons, to a degree that exceeds organismal abundances by an order of magnitude in many different ecosystems. 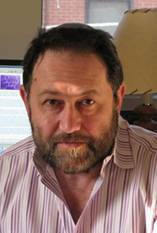 "The basis of classic Neo-darwinist population genetics rests on the notion of gradual differences arising (i.e., via point mutation) within a population.... By contrast, mobile genetic elements (MGEs) such as plasmids, viruses, and transposons are capable of producing large genomic changes and can jump between (classically defined) populations by crossing species barriers. In particular, horizontal gene transfer—the transfer of genes between organisms that are not related by heredity—creates novel gene combinations by shuttling genetic material between organisms that share the same environment. Such gene transfers can have an enormous impact on the process of biological evolution. "For the purposes of this article, we consider an event to be a HGT if it involves any transfer or introduction of any genetic material that does not stem from cellular replication. Evidence for HGT is wide-ranging. It occurs within and between all domains of life. The range of HGT encompasses the entire scale of organismal complexity, from viruses to multicellular eukaryotes. Time is apparently not a barrier: HGT events ranging from ancient to very recent have been reported. Indeed, there appears to be no absolute barrier to HGT, and we conclude that it is a generic feature of genome dynamics. "HGT is nearly undetectable between the organisms for which it is expected to occur the most frequently. "...Examples of recent beneficial HGT are abundant and reveal that HGT is still occurring in modern organisms." Nicholas Chia and Nigel Goldenfeld, "Statistical Mechanics of Horizontal Gene Transfer in Evolutionary Ecology" [PDF], arXiv:1012.2166v1 [q-bio.PE], Journal of Statistical Physics, manuscript posted 10 Dec 2010.